The Angriest: Black Lightning: "The Resurrection"
Jefferson Pierce (Cress Williams) is a high school principal in the crime-ridden city of Freeland. Nine years ago he was Black Lightning, an electricity-powered superhuman whose vigilantism made him a target of Freeland's police force and criminal underground. 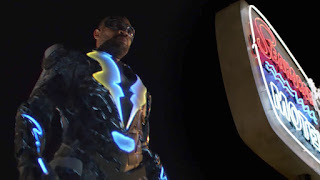 When his youngest daughter Jennifer (China Anne McClaine) gets unwittingly involved with the dangerous 100 Gang, Jefferson is forced to put the Black Lightning suit back on to protect her. After finding popular success with Arrow, The Flash, Legends of Tomorrow and Supergirl, the CW television network now adds a fifth television series about a DC Comics superhero. Is it overkill? Very probably, but thanks to a distinctive point of view and a strong lead performance it seems likely that Black Lightning will find a dedicated audience of its own. I hope it does: this is a very conventional but rather enjoyable first episode, and shows a lot of promise down the road. 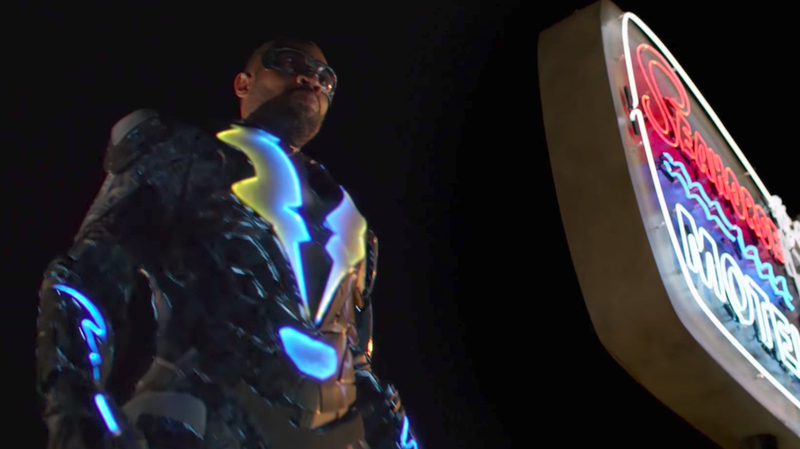 There are so many respects in which Black Lightning reflects most other superhero TV dramas - the reluctant hero, the gritty urban environment, the crime boss villain - that it's easier to point to ways in which Black Lightning differs from the norm. For one thing, I immediately like that Black Lightning adopts a strong and unapologetic African-American culture. The overwhelming majority of the cast comprises people of colour, and it threads a wide variety of personalities and character archetypes. Where there are white actors, they are generally playing racist police officers or the villain. It embraces a hip-hop soundtrack in a meaningful and effective fashion. That approach even extends to the casting: Martin Jones III, aka the rapper Krondon, plays the series villain Tobias Whale. As the titular hero, Cress Williams makes an immediate and hugely enjoyable impression. It is fascinating to see a superhero entering their series in middle age. He is not a young man or woman learning how to use their powers; he already knows how to use them. He does not need to learn the extent of his influence or the difference between revenge and justice; he's been there, done that, and retired from his responsibilities for close to a decade. The series is clearly still going to attract a younger audience via Jefferson's two daughters - at least one of whom displays super-powers by the time the series premiere concludes - but the middle-aged lead really does make the whole series stand out and offer a different enough point of view to justify its existence. This is a solid and enjoyable series premiere, with a lot of future potential. I will keep keeping an eye on Black Lightning as it goes.